This is a game, I always heard about, but never managed to learn and understand. It’s a casino poker game that is based on a game of Chinese dominoes, which is also known as ”Pai Gow”. The concepts and various aspects are really similar in both of these games, with an exception to cards being used in poker whereas the original game used dominoes. It’s not only players from Asia who love this gambling game – players worldwide are looking to learn and play it. Most online casino sites have also noticed big growth in demand, thus it’s actually really easy to find brands to play it at. To start with some data of the game, Pai Gow Poker is played & dealt by using a standard deck of 53 cards. Yes, 53 – along with all standard cards, there’s also a single Joker included, but we’ll get to that later on. You can’t place a stronger hand than the ”highest” hand, as the ”2nd highest”. However, bear in mind that you can split up some pair hands to make a very strong ”2nd highest hand”. You should always remember about a couple of things that are important in this game. The highest hand does not win you any money alone – both hands do. If you don’t have a really strong hand to put up using 5 cards, you might want to split a mediocre combination up and make a very strong ”2nd highest” hand. If you’re playing online, it will be simple to divide these hands – simply click on the two cards you want to use as your ”2nd highest hand” and you are good to go. Once you have finalised your decision, hit the ”done” button and dealer will reveal his hand. I have already stated this numerous times, but I will once more: Pai Gow Poker is loved because it’s a low variance game, where alot of splits (pushes) are experienced. You’ll often play over a dozen hands without winning or losing – it’s all entertainment! There are several scenarious possible, but before taking a look at that, I wanted to add that there is no pay-chart in this game, payouts are awarded using even money odds of 1 to 1. However, 5% comission is charged so the actual pay odds are 0.95 to 1. Your highest and second highest hands are both of a higher strength than dealers – you win an even money payout. Either your highest or second highest hand is better than the dealers, while the other is not. It’s considered as a push and you neither lose or win. Both of your hands are worse than the dealers – you lose both wagers. This might seem like a pretty complicated game, it did for me to at the beginning, but once you get used to it and play for a couple of rounds, you get the reasoning behind its massive popularity. It’s simply the ”nuts”! You can have a good time, potentially win a lot of cash, while keeping it all under control simply due to the fact that this is a very low variance game! Common strategy for Pai Gow Poker is to try and create a very strong 2 card hand, while not completely outranking the 5 card one. Note that ace high would be considered as a very strong 2 card hand! I will be honest – after you play the game a little, you’ll be able to easily determine and develop your own strategy based on logic! I guarantee it as well as that this will be the best casino table game you’ve played! 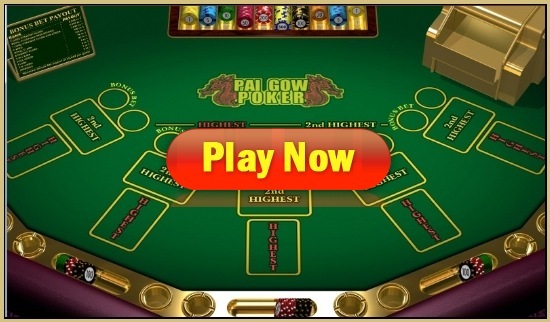 Are you ready to play some Pai Gow Online? I hope you are as I have a very special offer for you! With help of Winner Casino, I’ve managed to get an exclusive $/£30 Free Cash bonus at their casino for all new customers who sign up by clicking on either the banner or button from our site! There are no small prints, apart from the standard wagering requirements, and you’ll get the cash instantly after creating your account! Join Winner Casino Now – Click Here! Guts is a great alternative and welcomes all new players with a €/£/$300 Bonus Plus 100 Free Spins! CLAIM IT NOW – CLICK HERE!